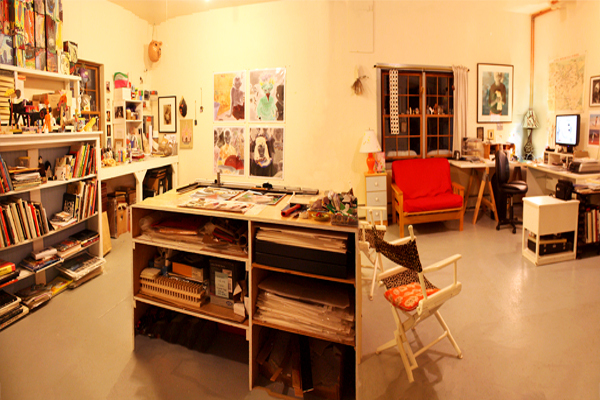 My studio is like a diptych, with two distinctive but complementary halves. In one half, there’s my digital darkroom where I get lost for hours and hours, creating my photographs and designing my books. I work with a tablet and a stylus, so when I’m in this half of the room, there probably seems to be a more overt sense of precision. It’s clean. And it’s dry. On the opposite side, there’s paint, glue guns, piles of junk, and bits and pieces of miscellany. There are also a lot of books. This is where I spend time designing projects for the CMCA ArtLab. It’s where I experiment with materials and work three-dimensionally. It’s often where I make a mess. I can’t imagine having a studio with just one of these halves. After spending many years in a dismal, dark loft on 29th Street in Manhattan, the third floor studio of our converted barn feels like being out on the Penobscot Bay on a beautiful summer day. Fifteen hundred square feet filled with light and space, a sanctuary where my paintings and drawings of ancient myths return to an imagined life and where my land and seascapes illuminate the dark of a Maine winter. My studio is the one constant where I feel renewal and peace. It’s the one place where my struggle to bring my art out into the world is replaced with the joy of simply being able to express myself without restraint. 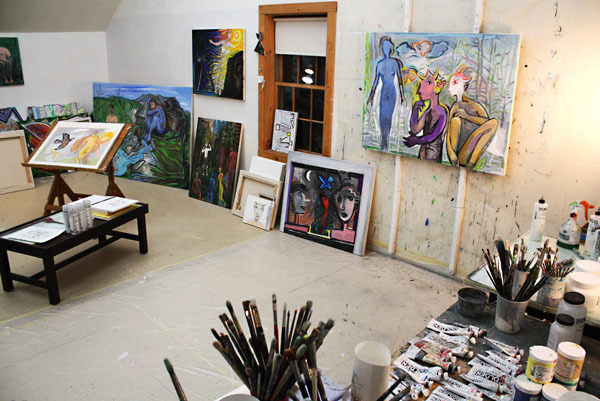 For many years I maintained a studio in an old mill building outside of Boston, with other artists a shout away. Now I’m in South Thomaston, and my studio is 250 square feet in my house overlooking the sea. For me, all the input is necessary. A studio is about commitment – walking into it every day, even if only to study what happened the day before. When I do that, I know my brain will also be at work while I sleep or while I’m driving around doing errands, so I’ll be ready to approach whatever project I’m on when I get to the studio. 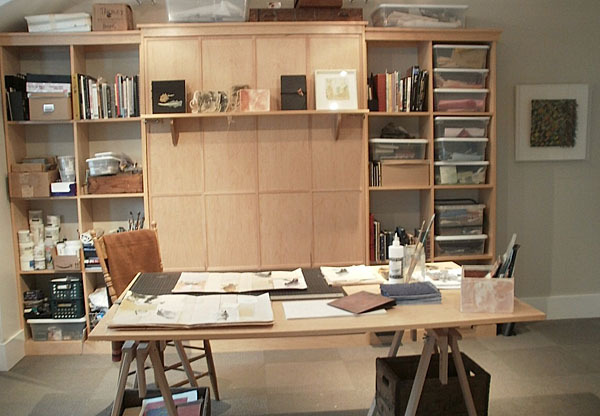 This is the working area of my studio in Lincolnville, Maine. To the left, off camera, are a table with oil paints and glass palette and, in the foreground, a paper prep plus storage table. All the tables are on casters so I can move them around depending on what I’m working on. Right now, I’m focused on woodcuts and the designs for those are on the right wall, along with some practice sheets for a collaboration with a Bulgarian artist and studies for large works on paper that will be part of an upcoming installation. 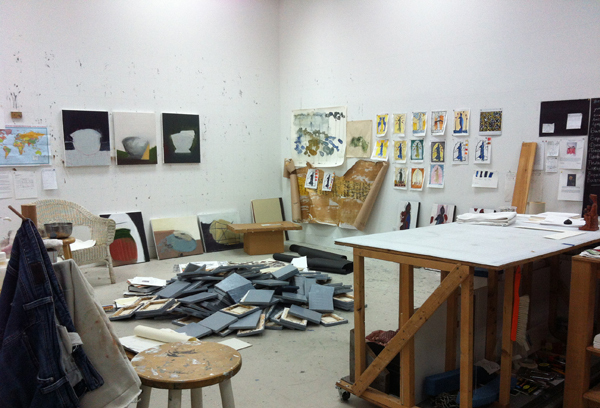 On the floor are 100 canvases — a nest egg for the same installation. The paintings on the left wall are coming out of a residency in Spain. The studio wall height is 12 feet, and the lighting is Blue Max fluorescents, which give me great daylight all year long.